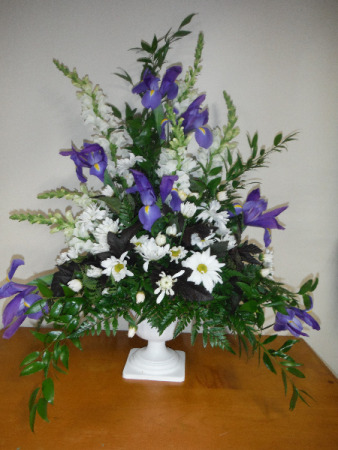 Seasonal arrangement with deep purple iris, white daisies, white snapdragons and greenery in an elegant urn. Iris, White Snaps, White Daisy Pomps Or Cushion Pomps. Let THE FLOWER GARDENS deliver a lovely floral expression of sympathy and reverence for you. This arrangement features white roses, Fuji mums, gladiolus, lilies and bells of Ireland.